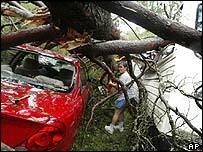 Hurricane Ivan has unleashed a series of destructive tornadoes in the south-eastern United States. Reports of the number of people killed in the US vary but the Associated Press agency says at least 22 died. Ivan has also killed some 60 people in the Caribbean, with Grenada, Jamaica and the Cayman Islands worst hit. Ivan has now been downgraded to a tropical depression but forecasters say Tropical Storm Jeanne could regain hurricane status over the weekend. Jeanne has killed at least two people in the Dominican Republic - including a four-month-old baby - and two in Puerto Rico. It is heading towards the south-eastern Bahamas, where a hurricane warning is in force. As Ivan hit from Florida to Louisiana with winds of up to 135mph (217km/h), at least a dozen tornadoes spun off. Homes were ripped apart, streets flooded and beachfronts battered by surges. Many holiday mobile home parks were destroyed. The dead included an eight-year-old girl who died when a tree fell on her house. Late on Thursday, Ivan was measured carrying sustained winds of 35mph (55km/h), where once they reached 165mph (265km/h). But it had already done significant damage along the US Gulf Coast. President George W Bush declared Alabama, Mississippi and Louisiana disaster areas. Florida had already been given that status after being hit by hurricanes Charley and Frances over the past six weeks. "It's sad," said Mr Bush's brother Jeb, the governor of Florida. "I don't know quite why we've had this run of storms. You just have to accept that." As the Caribbean continues to reel from the effects of Hurricane Ivan, the Red Cross has launched a $4.8m appeal to help tens of thousands of people made homeless. The Red Cross aims to support 85,000 people over the next six months in Grenada, Jamaica, the Cayman Islands and Cuba. Operations co-ordinator Ian Logan told BBC News Online that conditions were especially bad in Grenada, where 90% of buildings have been damaged. "We're looking at 60,000 people in Grenada who've lost everything, and that's out of a population of 100,000," he said. He added: "We've already had three hurricanes in a row that were category four or five in strength. This could be a one-in-50-year season. It's a devastating picture so far and we have to assume that there will be more." In another development, the United Nations released statistics showing more natural disasters are taking place and more people are killed or otherwise affected by them. It said 254 million people were affected by natural hazards last year - nearly three times the number in 1990. "Much of coastal Mississippi is under water"